The UW School of Medicine is a progressive biomedical research facility dedicated to understanding and improving the lives of people. 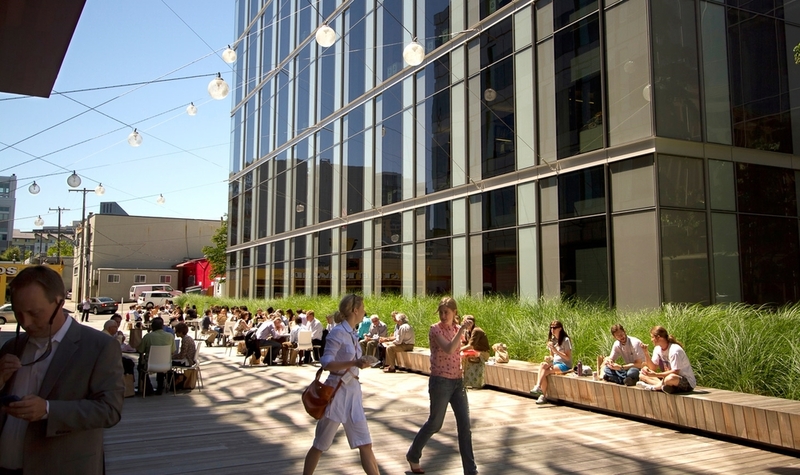 The campus is located in Seattle’s South Lake Union, a growing neighborhood that has emerged as a district for life sciences research facilities and institutions' campuses. Focused on building strong, urban connections with sustainable facilities, this urban campus sets the standard for future neighborhood construction. The open space concept – a simple cruciform layout for each block – is an extension of the neighborhood’s historic pattern of quiet East-West streets with greenery and active North-South passageways. GGN has designed landscapes for phases 1, 2, 3.1 and 3.2. At Phase 1 and 2, a wooden boardwalk widens as it approaches the south sidewalk, inviting the neighborhood into the campus. At Phase 3, faceted building facades and reflective water features serve to illuminate the meandering court below with soft light.